The Duchess of Cambridge today visited Lavender primary school children as part of her Place 2 Be Charity. The Duchess chose a vivid green shift dress for the occasion. The Duchess wore a bespoke dress by Eponine London. The thick wool dress features a high round neckline, long sleeves and a relaxed fit through the skirt, giving a 1960’s retro-shift-dress-feel. The dress has a stitched inverted pattern over the chest. A quirky feature of the dress are the two inset hip pockets with buttons. Below we show a dress in bright pink from Eponine London’s Spring Summer 2018 Collection; the dress is made from the same fabric, same neckline and pattern over the chest. However, this dress has a much morre exaggerated a-line flare through the skirt. We believe that the skirt on Kate’s dress more closely resembles the silhouette in the fuchsia pink below, with the coat showing the bright green below. This is the third ensemble that Kate has chosen from the label. Having worn a red and white check top and skirt and a blue coat dress. Princess Eugenie is also a fan of the label, choosing a red fit and flare dress with cutouts over the shoulder. 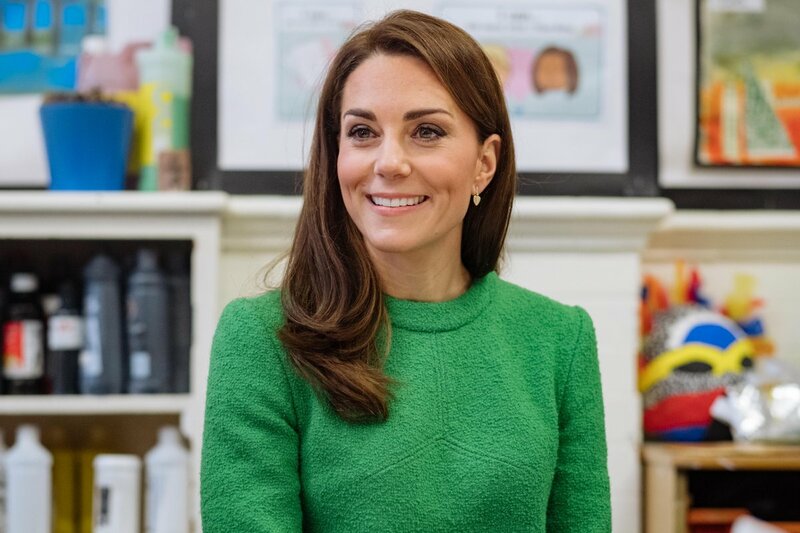 We were a little surprised by Kate’s choice today as she already owns several outfits in the same bright green colour-way and thicker woollen fabric, including her Erdem coat, and Hobbs skirt suit. Being a lover of recycling her clothes on multiple occasions we feel the Duchess may have just opted for one of her previous looks as they are all so similar. Kate chose a pair of street style fashion girl boots today. Kate wore L.K. Bennett ‘Marrisa’ suede boots, retailing for £295. The block heel ankle boots have a suede body with a wooden heel, an almond shaped toe, side zipper and laces threaded through large silver eyelets, running over half the boot. We love these boots for Kate, though not with this particular dress as they added quite a heavy element to a more fun, floaty and airy dress. Catherine carried her trusty Mulberry ‘Bayswater’, clutch bag. Kate has carried this black suede clutch with silver plaque and turn lock for years and is one of her go-to favourites. Kate accessorised with her Kiki McDonough ‘Lauren Pavé Leaf earrings’, retailing for. These gorgeous and delicate drops feature a small love heart inlaid with pave diamonds set in 18kt yellow gold. You can purchase the earrings here. We are still a little bit undecided about this look. The ankle boots with a vivid shift dress is quite a different look from Catherine but we’re not sure if all of the elements pull together to create a classic ‘Kate’ chic look. What do you think of the Duchess’ ensemble today?